How many pairs of jeans do you own? 10, 15, 20, or more? (“Consumer Reports” says the average woman owns seven pairs of jeans, but we think that’s shockingly low.) Whatever your number is, it’s about to get a whole lot higher after you check out these printed jeans. After all, who can actually decide between polka dots or animal print? Not us. 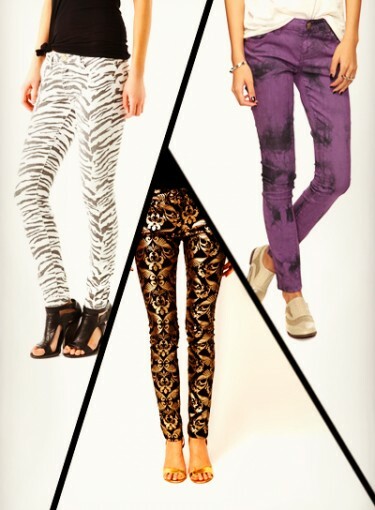 Click here to see all the different printed jeans. 1873: Blue jeans are invented by Levi Strauss and Jacob Davis, who add rivets to a denim pair of trousers. Costing only $1.50, these pants are mainly worn by factory workers. 1955: James Dean appears in “Rebel Without A Cause,” wearing blue jeans and a white T-shirt. The jean trend immediately explodes, and young people begin wearing denim as casual attire. 1960s and 1970s: People begin to personalize their jeans with patches and other embellishments. Non-traditional shapes also appear, like the bellbottom and the hip hugger. 1980s: Denim officially becomes high fashion with designers creating their own denim styles. Brooke Shields famously declares that nothing comes between her and her Calvins. Different types of washes, like acid or marbleized, become popular. 1990s: Jeans get big and baggy. Boys popularize the saggy pants trend, allowing their boxers to hang out the back of their jeans. 2000s: Skinny jeans take over. Instead of loosely fit denim, women and men choose to wear their jeans tight. This eventually leads to the invention of jeggings (jeans + leggings). 2010: No longer content with just blue jeans, denim starts showing up in every color of the rainbow. 2012: Denim goes a step further with the addition of prints. From stripes and brocades to plaid and florals, printed jeans are the new statement piece. So, what’s next in the world of denim? Jeans with blinking lights or pockets big enough to store a laptop? Ah, that’s too much to think about. As for right now, we’re beyond content with the printed jeans trend. Click below to see what all the fuss is about.